"Climate Change - the Impact: WEBISM World Traveling Show"
"Climate Change - the Impact" a WEBISM world traveling show kicks off the start of the European show branch on November 27th, 2008 at the historic KORNHAUS, Kempten, Oberallg�u, Germany in the framework of eza! 's 10th anniversary. Energie- und Umweltzentrum Allg�u (eza!) is a non-profit corporation that was founded by several municipalities, businesses and action groups to promote both energy efficiency and renewable energy. eza! collaborates with all media to inform the puplic of the advantages of energy conservation and renewable energy, and organizes events such as the Building Modernization Days. Twenty artists from around the world bring their art together to promote the cause. 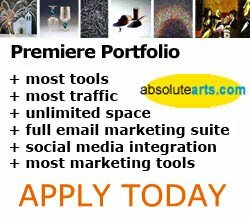 Many of these artists have Portfolios at absolutearts.com. The recent messages concerning the climate change split mankind into three camps - I always knew it - thus nevertheless, as terrible - all fearmongering, I do not want to know anything of Fact is, the climate change carries out themselves already for decades and accelerates themselves, while we watch. It is also not to be stopped in the foreseeable future. All statements for the future of our climate, to the influences on our life are based on existing data, which will be overhauled tomorrow. How do we see the consequences of the climatic change as artists? The exhibition started at the beginning of 2007 on-line and in the meantime the world-wide life exhibition became material. In August/September 2007 it was in " Dog" draws; in Durango, Colorado, to see the USA under the direction of Webism member Parys pc. Martin. Afterwards it was shown from January to March 2007 to invitation of the Galeristin Carol Mark in the ACA Gallery in Toronto, Canada. An international artist project Idea: Rainer Grassmuck, architect/artist/Webist from Wuppertal, Curator, Implemention and Co-ordinator for " Webism Group of Worldwide Artists": Ingrid Kamerbeek, Sonthofen. All of the artists point their work to the topic climate change on 27 November in the grain house in Kempten from cause of the 10j�hrigen of anniversary eza! Kempten. Since the topic concerns without exception all humans, it is for the project initiator and member of the Webism Group Rainer Grassmuck, also completely naturally to argue together with its world-wide artist colleagues this topic particularly since the climate change is influenceable only by world-wide co-operation. Ingrid Kamerbeek, Sonthofen, Oberallg�u - together with Dr. Rodney Chang (Pygoya), the USA founders of "Webism Group OF Worldwide Artists" - the artists of the world-wide Webism movement, whose activities it organizes and coordinates from Sonthofen, Oberallg�u, Germany. Explanations of " Webism": Webism, German Webism, is the name of a group of artists (" Webism Group OF Worldwide Artists") and an international movement of the contemporary art with professional artists from all ranges and forms of art. Webism is not only a virtual community, it is at the same time also an idea - collaborating the idea of art work without borders of space and time. Beyond that Webism is also the initiative to bring humans from all parts of the earth closer to each other through a contribution of communication by the people involved. The term was introduced 1997 of the American multi-task artist and Cyberart pioneer Dr. Rodney Chang, artist name Pygoya, that starting from 2001 together with the German artist Ingrid Kamerbeek the Webism developed further to a new international art movement. As a global art movement called "Webism Group OF Worldwide Artists" in November 2003 of Pygoya and Ingrid Kamerbeek from Sonthofen, Oberallg�u after their "1st European Material Life Kind Tour". The original goal of promoting the world-wide presentation of art on and off-line was supplemented by the idea of using the potential of networking media. Not only the artistic work of the particulars, but also the art are to affect the art actions organized together by the members of the group altogether and to contribute for the setting up world-wide eCulture. Webism is contemporary art of the 21sten of century. The artists and artists of the group use the net in multiple ways: The Internet serves as a supplier of raw material: From the net coming data (for instance photos) are used as raw material of the artistic work. Existing Internet contents are again-used and transformed with artistic intention. The net as platform of synchronous art work: Artists co-ordinate their work thematically and/or formally by means of network media and present the results of their co-operation in virtual and/or material areas. The Internet as medium of co-operation: Mediated over the network media - successively or interactively - common art objects are created. The net serves as artist contact forum: Artists of all media and directions become acquainted with themselves on-line and to compile together ideas and actions for material exhibitions and actions world-wide.